Pieced Brain: A possible friendship? My son Ryan and I captured this moment yesterday morning. Is it possible that Jamie and Sapphire will co-exist peacefully from now on? We have had three years of classic Tom & Jerry action at home with a twist: between cat and cat. 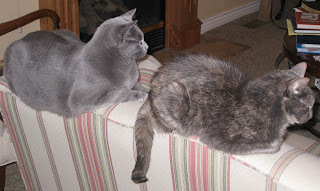 Jamie, about 18 years old and 6 lbs, and Sapphire, 3, weighing about 15 lbs, share the house somewhat unfairly, as Jamie does not venture much beyond the first floor, too old to risk being killed by curiosity. Feisty Sapphire may be getting mellower as she ages. Or so we all hope.